The course of true love, they say, never did run smooth. The affair between a person and a football club is often a complex romance, and with Everton sometimes it’s physically painful. Look at how it has been recently. A love that grew over time also became stale, and ended bitterly. But then came a whirling renaissance of passion that reinvigorated how we felt against our beloved side. It was a beautiful honeymoon, but right now the relationship between club and fans is just frustrating. What’s more is the arguments, which haven’t been this vitriolic since the rise of the Blue Union. Going into Saturday’s encounter with Chelsea the mood was one of concern but also confidence. We’re Everton. We can beat anyone. Yet after the utterly, utterly mad ninety minutes that followed the ego was shattered and suddenly there’s a greater confluence of opinion than ever before. So just three games into the new season, what has happened to cast such clouds over a previously sunny Goodison? What is causing the most internal strife for Evertonians is the constant tug-of-war going on right now between old and new, Martinez’s promised revolution versus our innate Everton-ness. Never did a result encapsulate this dilemma than Everton 3-6 Chelsea. The defensive deficiencies have been clear to see in the game away to Leicester and at home to Arsenal and Chelsea. Having let in just 21 home goals in all competitions last season, including zero against our first two Goodison opponents, the tally of eight conceded in the first two games back at the Old Lady is nothing short of diabolical. Throw in a second successive campaign which began with two goals conceded away to a side expected to be battling at the bottom of the table rather than the top and it becomes clear major scrutiny on the back line is needed. The back four of Coleman, Distin, Jagielka and Baines (with John Stones regularly deputising) was reliable last season, but so far it has been far from it. The major issues appear to be with fitness and mentality. These players all have the quality to play for Everton – all except Distin have been called up to represent their respective nations. Three bad games does not mean that any of these players are past it and need to be dropped indefinitely. What is going wrong is easily identifiable and can be ironed out. One a lot of people have noticed is the backing off our defenders are doing at the moment, which is giving players a lot of space and time. The two best examples are Aaron Ramsey’s goal for Arsenal and Nemanja Matic’s goal for Chelsea. In these two instances Seamus Coleman and Sylvain Distin are guilty of giving the attacking player – Nacho Monreal and Matic respectively – at least five yards of space. Two or three is fine – it slows down forward movement but also means a pass or shot can be blocked. It’s basic. Children are taught it now. 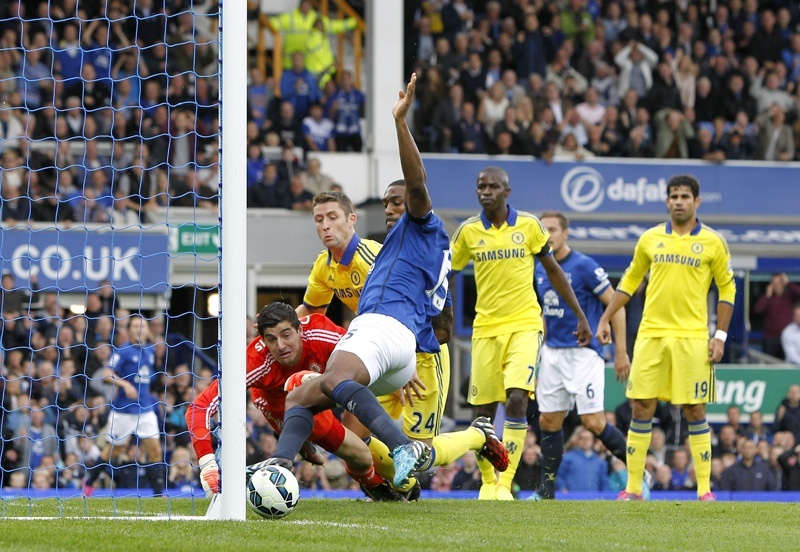 But somehow both Coleman and Distin failed to deal with the threat. With Chris Woods’ late equaliser for Leicester and Ramires’ strike for Chelsea the problem is even worse. The only way players could have that much space in the penalty area is a complete lack of awareness. The defence has not clicked at all this season. Take both of Chelsea’s first two goals. For the first, Phil Jagielka decided at the last moment to try and spring an offside trap, despite none of his fellow defenders doing the same. Branislav Ivanovic was offside for the second goal but it was very almost the same story. And then Leonardo Ulloa’s goal for Leicester highlighted what for me has always been Sylvain Distin’s biggest flaw – his panic when in either penalty area is palpable. A scythed clearance was perhaps unfortunate in that it fell perfectly for Ulloa but such panic never reaps any positive dividends. 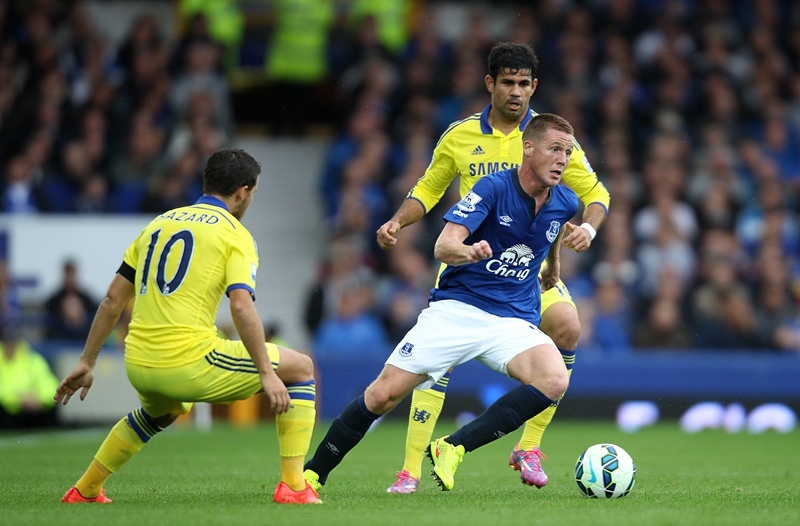 In front of them, James McCarthy and Gareth Barry bear a great responsibility too. This season Barry has sat on the left side and covered for Leighton Baines when he goes forwards, and McCarthy has covered for Seamus Coleman. Looking at the goals conceded thus far, the attacks that create them have mostly come from the right hand side. As much as this is punishment for the right back, so far Stones and Coleman, it also reflects on the player who has to cover for them. Eden Hazard’s run that ended in an unfortunate own goal for the latter has to be chalked down as poor play on McCarthy’s part, and a lot of emphasis will be placed on his ability to protect the defence. The lack of fitness accounts for a lot too. 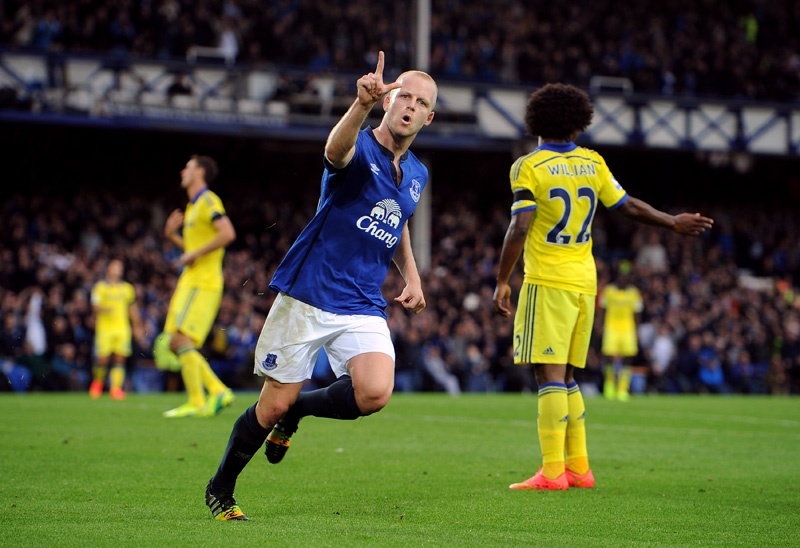 Jagielka is clearly a few yards behind his best, and he’s not the only one. The best explanation for this would be a pre-season regime blighted by players returning late from the World Cup. Romelu Lukaku is in the same boat, although stamina has always been an issue for him. Then why was Diego Costa, who himself kicked off his pre season late after the World Cup, still able to waltz through the Everton defence in the ninetieth minute just as he did in the first? And what can we do to resolve this? The simple answer is focus and hard work, although it’s more than just managerial cliches. Roberto Martinez now has a weekend off to analyse in detail the three games played thus far, and identify weaknesses. Intense training regimes can then focus on these problems and iron them out; this is where coaches earn their keep. In terms of fitness international duty is a major hindrance but even those flitting off to join their national sides will get at the very least more training under their belt and possibly 180 minutes of football. As Martinez pointed out, those staying at Finch Farm like Samuel Eto’o can undertake training and fitness sessions tailored to their needs, which only speeds up the process of reaching full fitness. Eto’o brings us onto the great positive. Our attack has, three games into the season, scored seven goals. As well as being the first attack to score three past Chelsea in the Premier League since Stoke in December 2013, we have equalled our best ever goal tally after three Premier League games; it matches the opening to 1993/94, in which 7 goals notched in wins against Southampton , Man City and Sheffield United. Of course, that turned out to be one of the worst seasons in the club’s history, so let’s move on quickly from that comparison. The point is that finally an Everton side looks like one of the most potent in the league. Romelu Lukaku’s lack of goals so far is offset by the fact he had not even joined the club until this point last year, while Samuel Eto’o and Steven Naismith are natural goal poachers. Both showed their lethal finishing against Chelsea, while Kevin Mirallas, Aiden McGeady and Seamus Coleman have notched goals already. Goals are coming from everywhere, which is a huge positive. The attacking midfielders playing behind either Lukaku or Eto’o have a big job on their hands – the wingers must both create chances by working with full backs and protect them by tracking back, while Steven Naismith will see most of the attacking play go through him. So far this has meant Naismith has seen a lot of the ball in his favoured central position, and when Lukaku moves wide or takes a defender with him Naismith can make a late run, exploit the space and have efforts on goal. If he remains as clinical as he has been so far, with three goals scored in the opening three games, it could be a breakthrough season for him. Of the wing players – not enough has been seen of Atsu in an Everton shirt yet – only Steven Pienaar looks comfortable as a wide man. The three most significant contributions made by Aiden McGeady so far – his assist for Mirallas in last season’s win over Fulham, the goal scored against Leicester and his cleverly disguised ball to Coleman which lead to Mirallas’ goal against Chelsea – came when he moved into a central position. Out wide he has struggled to beat defenders and very few crosses have been successful; only the one that eventually resulted in Seamus Coleman’s winner against Cardiff in May comes instantly to mind. Mirallas is an incredibly frustrating player – for every flash of brilliance comes a rash decision. Against Chelsea, moving across the front line and attacking from the left, centre and right at different points, he was at his lightning fast, trick-laden best. Yet bizarre passing choices against Arsenal and on occasion against Chelsea leave a bitter taste in the mouth. Again, this is a matter of mindset that needs serious work. Now if we consider that I, some journalistic wannabe, has seen these problems and highlighted flash points in games, imagine what Roberto Martinez and the coaching team has spotted from hours of watching tapes and training sessions. All that fans can provide at this point is support – if you trust the management of a squad, then you can trust the squad to improve. The senior side is threadbare but the young players coming in offer an exciting new dimension and appear to be trusted by Martinez. Next up is West Brom away, and if the international break is used for some serious retrospection and improvement, we should see a different Everton side to the one that has so far played some suicidal and error-laden football. “In Martinez We Trust” is so often bandied about almost as a catchphrase by some that it begins to lose meaning with repetition. But right now it means more than it ever has. The honeymoon may be over but the love affair never ends. How happy the ending to this story is remains to be seen.